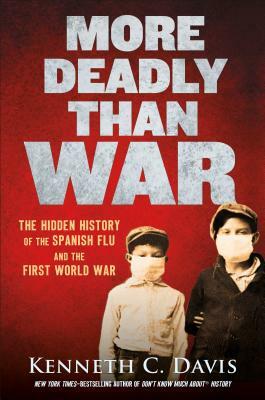 From bestselling author Kenneth C. Davis comes a fascinating account of the Spanish influenza pandemic 100 years after it first swept the world in 1918. With 2018 marking the 100th anniversary of the worst disease outbreak in modern history, the story of the Spanish flu is more relevant today than ever. This dramatic narrative, told through the stories and voices of the people caught in the deadly maelstrom, explores how this vast, global epidemic was intertwined with the horrors of World War I—and how it could happen again. Complete with photographs, period documents, modern research, and firsthand reports by medical professionals and survivors, this book provides capitvating insight into a catastrophe that transformed America in the early twentieth century. "More Deadly Than War is a riveting story of the great influenza pandemic of 1918, packed with unforgettable examples of the power of a virus gone rogue. Kenneth C. Davis's book serves as an important history—and an important reminder that we could very well face such a threat again." —Deborah Blum, New York Times bestselling author of The Poisoner's Handbook: Murder and the Birth of Forensic Medicine in Jazz Age New York. Kenneth C. Davis is the New York Times bestselling author of America’s Hidden History and Don’t Know Much About® History, which gave rise to the Don’t Know Much About® series of books for adults and children. A frequent guest on national television and radio and a Ted-Ed Educator, Davis enjoys Skype visits with middle- and high-school classrooms to discuss history. He lives in New York City.